One of the most magical things about living in California is that Meyer lemon trees grow in backyards. Sweet, bright, and beautifully floral, Meyer lemons offer up a unique flavor profile that fans think leaves other lemons in the dust. What’s the difference between Meyer lemons and other lemons? Eureka and Lisbon lemons, the varieties most of us think of as “lemons” are much more acidic and much less sweet than Meyer lemons. They have also been bred to ship and last, with thicker skins. Meyer lemons, by contrast, have thinner skins and are more fragile or delicate. The sweeter flavor of Meyer lemons means they can’t be used as a direct substitute for other lemons. Traditional lemon bars made with Meyer lemon juice, for example, won’t have any of the acid hit to offset the sweetness and the sugar will overwhelm the floral aroma that makes Meyers so popular. Where Meyer lemons shine is in recipes designed with their sweeter nature in mind. This Meyer lemon ricotta cheesecake adds an almond crust for a nutty edge. These individual Meyer lemon tarts make a lemon filling with the sweetness of Meyer lemons in mind, so their unique flavor comes through. Meyer lemon curd with honey brings two floral notes together and Meyer lemon yogurt cake uses the acid in yogurt to bump up the milder lemon effect Meyers bring to the party. Meyer lemon lemonade, while delicious, requires less sugar and won’t have the puckery effect some people crave. Since Meyer lemons come into season in the dead of winter, try using the juice in a hot toddy, or try a bark and no bite, a version of a hot toddy featuring Meyer lemon juice and nettle-infused honey syrup. 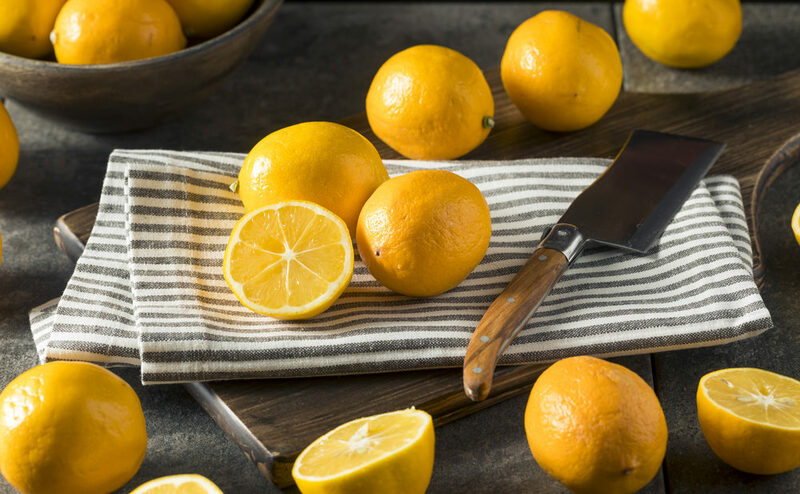 Meyer lemons shine in instances where their softer acidity is an advantage. In salad dressings, salsas, and fruit salads. As well as gentle savory dishes such as risotto with peas and Meyer lemon or grilled halibut with Meyer lemon salsa. You can also slice Meyer lemons, lay them on a parchment-lined baking sheet, and run them under the broiler. The heat softens their peels and caramelizes their sugars. Once browned, let cool. Chop and add to salads or use as a relish. If you end up with a bumper crop, turn them into a piquant condiment. See how to preserve Meyer lemons for directions on how to salt them down, a process that renders their thin but toothsome peel into something luscious and tender. Like all citrus, Meyer lemon trees like warmth—they can stand a bit of cold but frost is a killer, at least of that year’s crop. They also need plenty of water and good drainage. Meyer lemons have thin skins and the trees have delicate branches (at least compared to other citrus trees). For that reason, they don’t like wind. Meyer lemon trees, especially dwarf varieties, do well in containers. So they can be successfully grown in colder climates as long as they’re brought indoors when things turn chilly. See more about growing them here. When are Meyer lemons in season? Whether you grow them yourself or are looking for them at the market, the time to expect fruit is January through May—although anecdotal experience says that depending on the location, recent pruning history, and recent harvest history can lead to harvests from an individual tree being much longer or much shorter. Such is the delight of an unindustrialized crop.